On December 20, 1820, Tennessee farmer and Edgecombe County native John Bell died at his home in Robertson County, Tennessee. 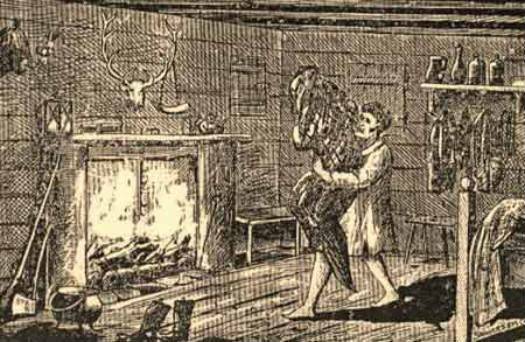 Decades later, Bell’s demise was attributed to the “Bell Witch,” a poltergeist that allegedly tormented the family between 1817 and 1821. There are no contemporary sources for the legend. The earliest known mention was published in an 1886 history of Tennessee. The first full treatment was written in 1894 by newspaper publisher Martin Van Buren Ingram, supposedly based on a reminiscence in the diary of an adult son of Bell who was a child at the time of the purported events. The original copy of the diary has never surfaced. All subsequent accounts derive from or elaborate on Ingram’s book. According to Ingram, an invisible entity with a female persona physically and verbally harassed members of the Bell family, especially John and his daughter Betty. The witch supposedly poisoned Bell with a mysterious potion. Various theories for the witch’s origin and motives rely on Ingram’s “evidence” and often contradict the historical record. The Bell Witch story partially inspired the film The Blair Witch Project. A number of recent films and television shows have been made about the Bell Witch legend itself.